14 arc minute by 9.5 arc minute section of a Hyper Suprime-Cam image, with contour lines showing the dark matter distribution. 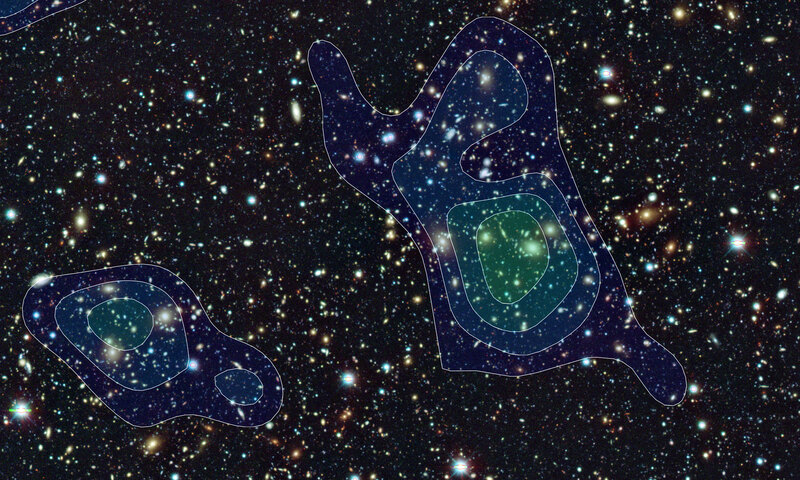 Using weak gravitational lensing the newly developed Hyper Suprime-Cam on the Subaru telescope has revealed nine large concentrations of dark matter, each the mass of a galaxy cluster. 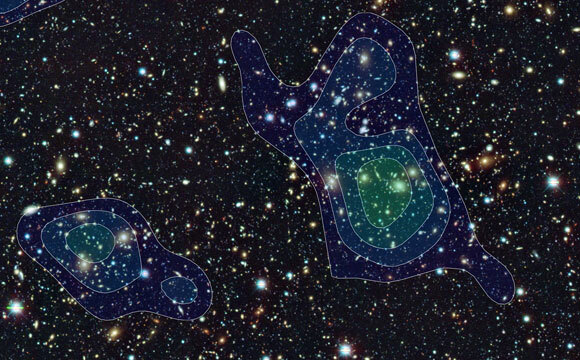 Researchers from the National Astronomical Observatory of Japan (NAOJ), the University of Tokyo and other institutions have begun a wide-area survey of the distribution of dark matter in the universe using Hyper Suprime-Cam, a new wide-field camera installed on the Subaru Telescope in Hawai’i. Initial results from observations covering an area of 2.3 square degrees on the sky toward the constellation Cancer revealed nine large concentrations of dark matter, each the mass of a galaxy cluster. Surveying how dark matter is distributed and how the distribution changes over time is essential to understanding the role of dark energy that controls the expansion of the universe. These first results demonstrate that astronomers now have the techniques and tools to understand dark energy. The next step is for the research team to expand the survey to cover a thousand square degrees on the sky, and thereby unravel the mystery of dark energy and the expansion of the universe. These are the first scientific results from Hyper Suprime-Cam and were published in the July 1, 2015 edition of the Astrophysical Journal. 5 Comments on "Astronomers Reveal Nine Large Concentrations of Dark Matter"
Dark matter is only a hypothesis used to explain unexpected rates of expansion within our universe. It’s possible that expansion rates are influenced by factors outside our universe. There may be multiple universes out there exerting gravitational forces on our little galaxies. The work reported in this article may be mapping the distribution of extra-universal forces, rather than the hypothesized dark matter. Dark matter and dark energy have not even been proven that it even exists, yet people keep claiming to “found” it. I understand the fundamental belief and theory behind it all, but seriously…another way to explain the unexplainable to rationalize something that cannot be seen, felt, or measured. To prove such a thing exists, one must prove there is a definitive and pliable boundry to the universe itself, then show the flow and movement of said universe is either directly affected by internal or external forces. Internal forces showing a pliable stretch to the universe allowing little to no resistance outside the said universe, thusly dampening the multiverse campaign to some degree. External forces should indicate random movement in various directions of galaxies, but, with similar patterns and pathways. Really? How do you defend this article? Scientists don’t even know what dark matter is much less have the ability to identify it’s location. I was waiting, while reading, to find out how they identified these regions, but it was never stated. I’m guessing that they’ve identified regions of extreme gravity and deduced that’s where the hidden gold lies. I consider the term dark matter as an indication of lazy science. There’s indication of extra gravity and since matter creates gravity there must be some hidden matter causing it. As far as I’m concerned they might as well say that God’s hands are holding the galaxies together. There’s an equal amount of evidence of that as there is of some mysterious form of matter that we can’t see, feel or otherwise relate to. Sad that scientists can’t just say that there’s evidence of extra gravity and we don’t know whats causing it, but we’ll get back to you when we have something substantial to report on the topic. I proposed a theory in which time is not constant, actually slowing as the Universe disperses mass – using 3 beakers, mark one for mass, time, and space. Filling the mass beaker with water 100% would represent the Big bang, after that the water is dispersed equally to the other 2 symbolizing the expansion of the Univesre- space and time increases until all reach 33.33% capacity.. Then the cycle reverses, refilling the mass beaker and also representing the collapse of the Universe. Would this not explain the illusion of ‘dark matter’ as we may account for ‘redshift’ peering over vast distances but not ‘timeshift’? I agree with BigEdge, who says that multiverse gravitational theory holds no water, since the stretching should be in different directions of our universe, as against our known regular hyperbolic expansion of the Universe where we liv in, which calls for some force from within, probably dark matter.Thank YOu.